Photo: NTEN and NetSquared volunteers at the 18NTC Organizer Day session. I just returned from the Nonprofit Technology Conference (NTC) in New Orleans and I'm still energized. I look forward to NTC every year – it's the only conference I attend religiously. With over 100 sessions it's the how nonprofit techies keep on top of emerging trends and best practices. But I have to make a confession: in the seven years since I started attending I've sat through less than five sessions. Instead, I treat NTC like Thanksgiving and Christmas combined – an intense family reunion for the 2,000 squabbling/loving siblings who use tech for good. The sessions are interesting, but the real value comes from the relationships we build in the hallways and after-parties. But I'd say that, wouldn't I? I'm a confirmed community evangelist, having served as a NetSquared co-organizer in Vancouver for the last nine years. I host miniature versions of NTC every month to provide nonprofits with hands-on help and a community of practice to share best practices. I'm convinced that the most effective way to support nonprofit's strategic use of technology is to get out of the way and have them teach each other. TechSoup invests in nonprofit tech community by supporting NetSquared, a global network of in-person meetups for nonprofit staffers. Every month our 120 groups are showcasing local nonprofit case studies to help the sector do more good and raise more money. Each meetup chapter is run by a team of skilled volunteers and I support the organizers with ideas, connections, and marketing support. And that's the real reason I love NTC – it's the one time of year I get the opportunity to meet a big group of NetSquared volunteers face-to-face. It's my chance to tell them how AMAZING they are and let them teach each other event hosting best practices. 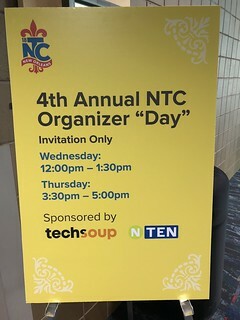 TechSoup sponsored NTEN's annual Organizer Day. It's a series of trainings held during NTC bringing together NetSquared and NTEN volunteers for peer-driven discussions about how to grow and sustain our communities. This year we talked about how to create welcoming spaces and techniques for building community within our organizing teams. But for me the main takeaway was that attendees left reinvigorated and committed to the role. In fact, the best way I can retain NetSquared volunteers is to get them together in a room so that they can become infected with the germ of Tech4Good community. "I went to the organizers' gatherings at NTEN and I'm feeling pretty fired up - I expect to do more in coming months. Maybe I could take on coordinator responsibility." And then he did! He's now the lead organizer of the group! The infection can even take hold for people who couldn't attend the conference. San Francisco Tech4Good co-organizer Regina Walton saw the NTEN Honoree wall online (on which she's included as a past NTENy winner) and was moved to tears by being reminded that she's part of a global movement of community conveners. There's a special magic that happens when nonprofit techies get together in a room – trust me! So it's totally worth the time and treasure to make it happen. Easy: find your local NetSquared group. We're in 120 cities! Harder: attend the next NTC conference in Portland, OR. It's March 13 - 15, 2019 and you won't regret attending. Finally, here's a practical event-hosting tip to help make your next in-person event go more smoothly. 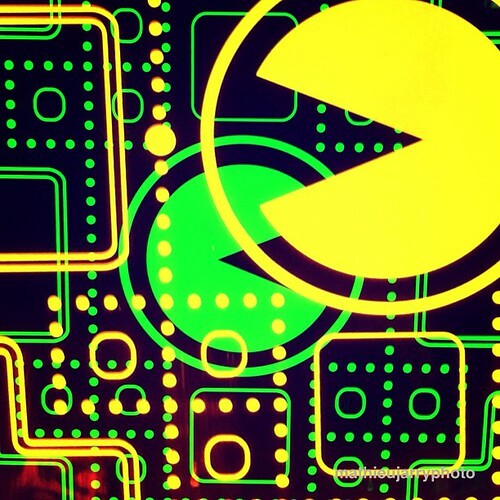 My top takeaway from NTC came from Bethany Lister, who shared the Pac-Man Rule. When standing as a group of people, always leave room for 1 person to join your group. Leaving an open space (the mouth of Pac-Man!) gives people explicit permission to join new groups of people.